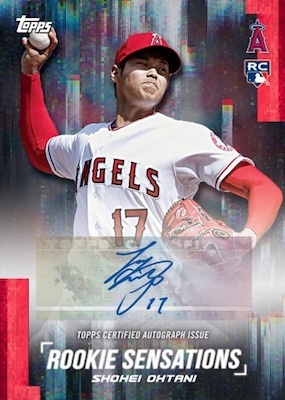 Once again letting Topps issue limited-time sets for many of their licenses under one larger brand, 2018 Topps On Demand is a print-to-order release featuring full base sets and, in many cases, guaranteed autographs. 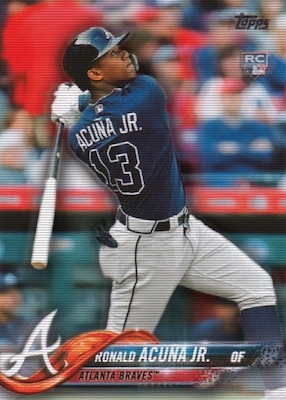 Expanding the line first revealed in 2017, each 2018 Topps On Demand set has a specific theme. If last year is any indication, collectors can expect a lot of MLB choices and entertainment franchises, starting with Star Wars: Rebels. 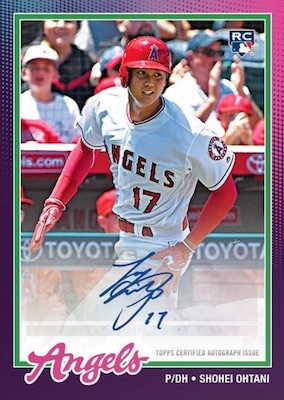 Because there are a finite number of signed cards in the sets that have them, 2018 Topps On Demand sets can sell out early despite having an extended sales period of a week or more. Free shipping is available if USPS is selected. 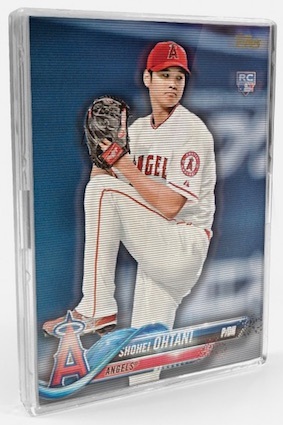 Check back for updates to the 2018 Topps On Demand checklist and set details for each new option. Shop On Demand sets on Topps. 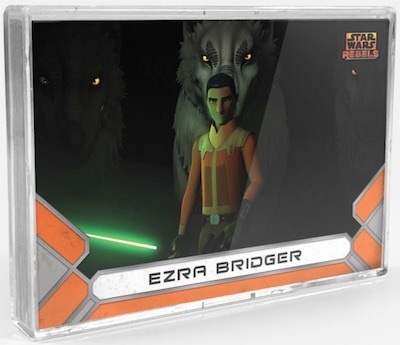 Paying tribute to the final episode of Star Wars: Rebels, 2018 Topps On Demand Set #1 includes a full 20-card base set, one base parallel, and one random autograph for $50. 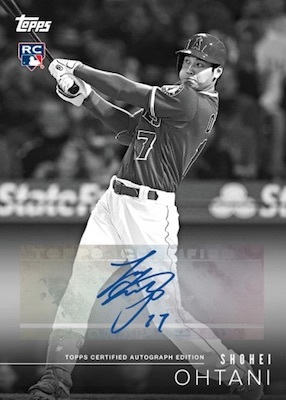 Base and autograph parallels include an unnumbered option, plus versions limited to 10, five and one-of-one. 20 total base cards and 14 signers. Buy on eBay. Final Print Run = 461 sets. Each sealed pack has full base set, 1 base parallel and 1 autograph. PARALLEL CARDS: Parallel (not #'d), #/10, #/5, 1/1. AUTOGRAPH PARALLELS: Parallel (not #'d), #/10, #/5, 1/1. 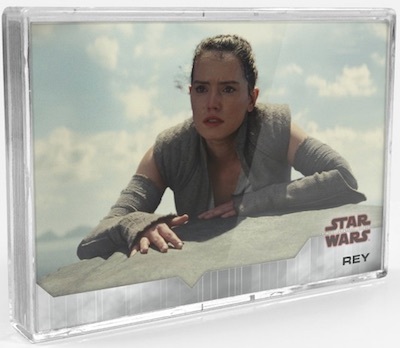 Bringing fans a truncated look at The Last Jedi, 2018 Topps On Demand Star Wars: The Last Jedi features a character-filled base set of 20 cards. 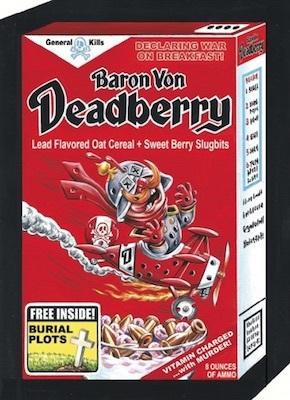 The full set is included in each pack. 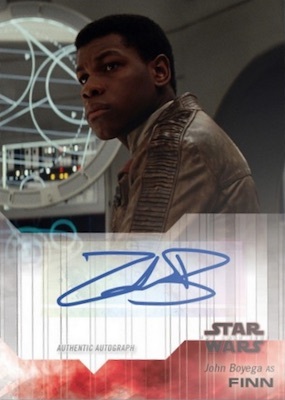 Every $50 set also contains a random base parallel, plus an actor autograph from a lineup that features Adam Driver as Kylo Ren, Daisy Ridley as Rey, and John Boyega as Finn. 20 total base cards and 15 signers. Buy on eBay. Final Print Run = 481 sets. PARALLEL CARDS: Parallel (not #'d), Blue #/10, Red #/5, Gold 1/1. AUTOGRAPH PARALLELS: Parallel (not #'d), Blue #/10, Red #/5, Gold 1/1. 30 total base cards, 14 inserts and 25 signers. Buy on eBay. Final Print Run = 1,700 sets. Each sealed pack has full base set, 3 chase inserts and 1 autograph. BASE/INSERT PARALLEL CARDS: Green #/50, Purple #/25, Blue #/10, Red #/5, Gold 1/1. AUTOGRAPH PARALLELS: Blue #/10, Red #/5, Gold 1/1. 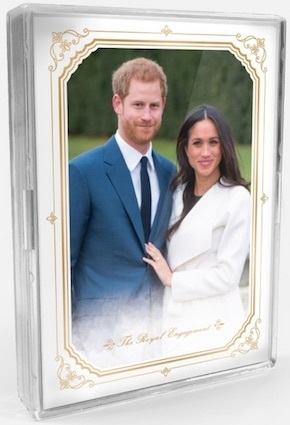 Celebrating the royal wedding of Prince Harry and Meghan Markle, 2018 Topps On Demand Royal Wedding Commemorative Set uses photography from the wedding itself and the related events to produce a 20-card set. The product has a longer sales period than normal at two weeks. Each set sells for $19.99 with free USPS shipping. 20 total base cards. Buy on eBay. Final Print Run = 1,134 sets. 35 total base cards, 15 inserts and 23 signers. Buy on eBay. Final Print Run = 1,666 sets. Each sealed pack has full base set, 4 chase inserts/parallels and 1:2 chance for an autograph. BASE/INSERT PARALLEL CARDS: Sepia #/60, Background #/25, Full Player #/10, Full Color 1/1. 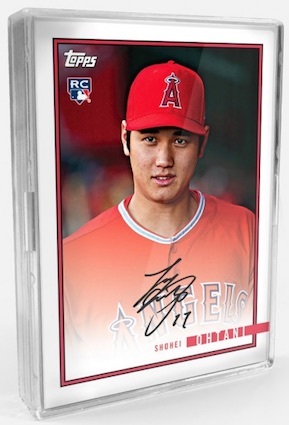 AUTOGRAPH PARALLELS: Background #/25, Full Player #/10, Full Color 1/1. 30 total base cards, 20 inserts and 29 signers. Buy on eBay. Final Print Run = 2,040 sets. Each sealed pack has a full base set, 3 chase inserts, 2 numbered parallels and 1:2 chance for an autograph. BASE/INSERT PARALLEL CARDS: Purple #/75, Blue #/50, Red #/10, Gold 1/1. 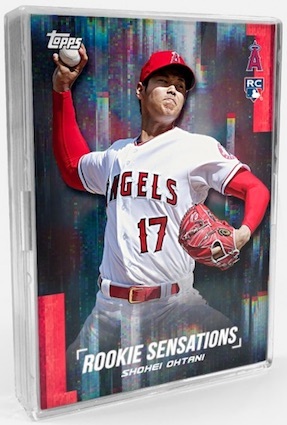 Bypassing the autographs, 2018 Topps On Demand 3D adds lenticular technology to 100 subjects from 2018 Topps Series 1 and Series 2 Baseball. Every sealed set includes five base cards and three inserts for $19.99. The inserts are broken down into three different 10-card sets covering Hitters, Pitchers and Top Rookies. 100 total base cards and 30 inserts. Buy on eBay. Final Print Run = 5,378 packs. Each sealed pack has 5 random base cards and 3 chase inserts. 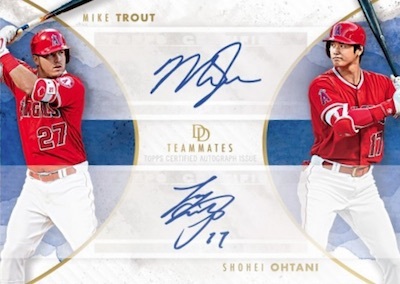 Priced at $150 per pack, the 2018 Topps On Demand Dynamic Duals set is more expensive than normal, but the payoff is one guaranteed dual autograph. The many player combos feature themed groups like Award Winners, Hall of Fame, Position Players, Teammates, and Youngsters. In addition to the autograph, every pack contains 30 base cards, one parallel and one Dynamic Duos insert. 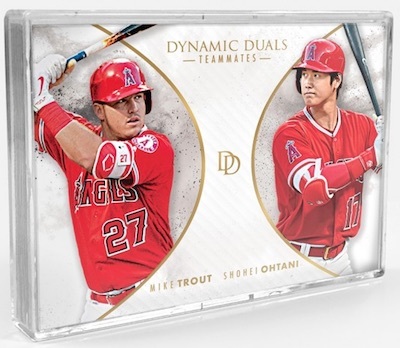 Like the majority of these sets, 2018 Topps On Demand Dynamic Duals only lasted a few hours before selling out. 30 total base cards, 10 inserts and 30 dual autograph cards. Buy on eBay. Final Print Run = 700 sets. Each sealed pack has 30 base cards, 1 parallel, 1 chase insert and 1 dual autograph. BASE/AUTOGRAPH PARALLELS: Parallel (not #'d), #/10, #/5, 1/1. Juan Soto & Ronald Acuna Jr.
Getting away from the MLB focus of late, 2018 Topps On Demand GPK Memes features the satirical Garbage Pail Kids. Selling for $40 apiece, each pack includes the full 20-card base set of A-Names and B-Names, plus one Pink parallel, three Green parallels and one C-Name variation. 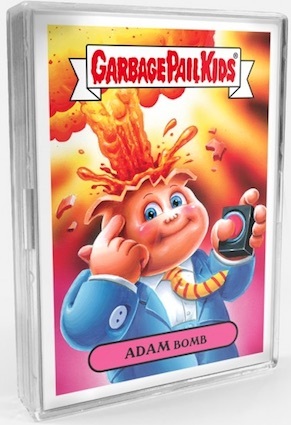 There is also a good shot to pull a Sketch card because every other pack of 2018 Topps On Demand GPK Memes has one. 20 base cards and 10 C-Name chase insert cards. Final Print Run = 500 sets. Each sealed pack has 20 base cards, 4 parallels and 1 C Name variation. Sketch cards average 1:2 packs. BASE PARALLELS: Green (3 per pack), Pink (1 per pack). 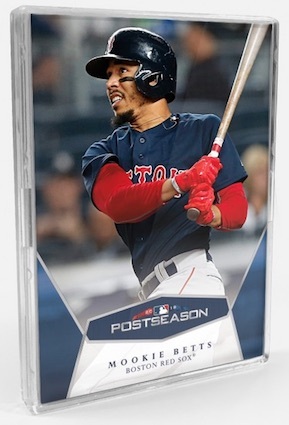 Coming in at $75 per pack, 2018 Topps On Demand MLB Postseason Baseball highlights playoff action of past and present. 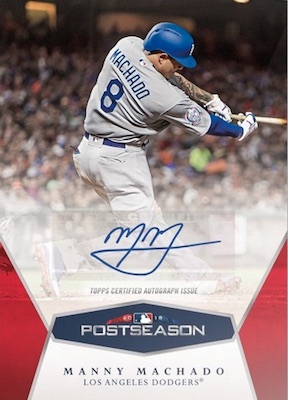 Each purchase gets you the full 30-card base set, two base parallels, one random autograph, and one each of the chase inserts, including Postseason Heroes, Postseason Traditions and the nine-piece Postseason Mural Puzzle cards. 30 total base cards, 32 inserts and 24 autograph cards. Buy on eBay. Final Print Run = 874 sets. Each sealed pack has 30 base cards, 2 parallels, 3 chase insert and 1 autograph. BASE PARALLELS: Parallel (not #'d), #/10, #/5, 1/1. AUTOGRAPH PARALLELS: #/10, #/5, 1/1. 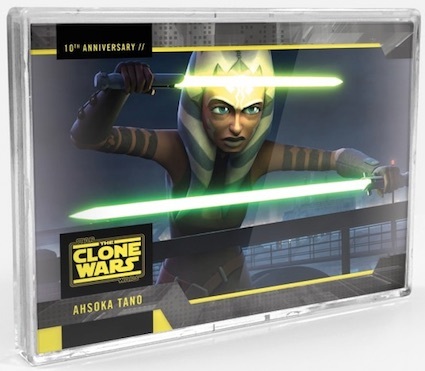 Honoring a decade since the debut of the animated series, 2018 Topps On Demand Star Wars The Clone Wars 10th Anniversary looks back at the key characters. 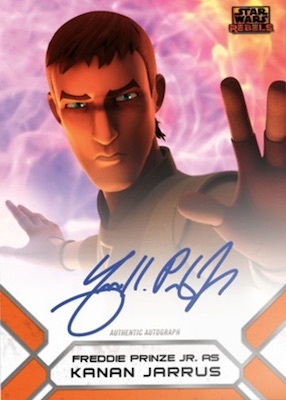 Each sealed pack includes all 25 base cards, one base parallel, and one voice actor autograph. The limited-time release sells for $50. 25 total base cards, 21 autographs and 5 dual autographs. Buy on eBay. Final Print Run = 212 sets. Each sealed pack has 25 base cards, 1 parallel and 1 autograph. BASE PARALLELS: Purple, Blue #/10, Red #/5, Gold 1/1. AUTOGRAPH PARALLELS: Purple, Blue #/10, Red #/5, Gold 1/1. 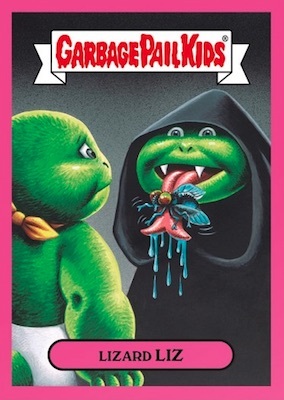 Continuing the long-running line, 2018 Topps On Demand Wacky Packages Old School 7 offers up even more base stickers. 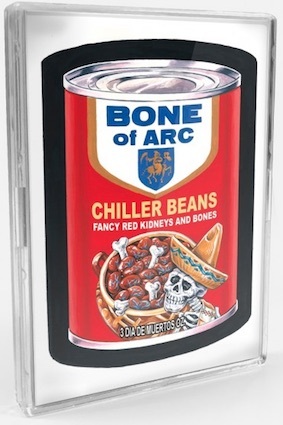 The 30-card set also adds base parallels, Pencil Roughs and even hand-drawn sketch cards. Collectors have two different ways to complete the set. Format A sells for $50 and contains one sketch card, 10 base stickers, five parallels (2 Tan / 2 Black Ludlow / 1 Red Ludlow) and five Pencil Roughs. Format B goes for $150, but it has the entire base set, plus three sketch cards, 15 parallels (6 Tan / 6 Black Ludlow / 3 Red Ludlow) and 15 Pencil Roughs. 30 total base cards. Buy on eBay. Final Print Run = 955. Version A - 10 base cards, 5 parallels, 5 Pencil Roughs, and 1 sketch. Version B - 30 base cards, 15 parallels, 15 Pencil Roughs, and 3 sketches. 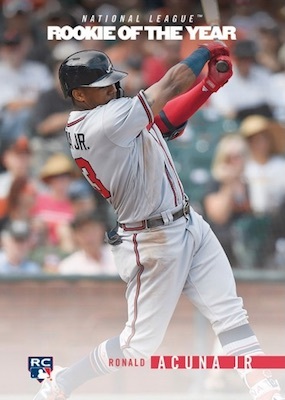 BASE PARALLELS: Tan, Black Ludlow, Red Ludlow. 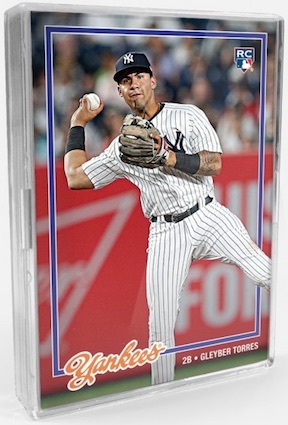 Wrapping up the 2018 MLB rookie season, 2018 Topps On Demand Rookie Year in Review goes deep into the RC class with a full 49-card base set per pack. Most of the players are also among the sticker autograph options that come one per pack. 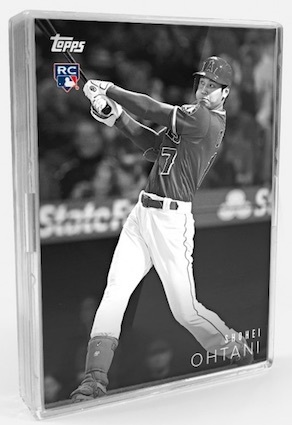 Each pack also includes two Rookie of the year Tribute chase inserts and one base parallel. These are priced at $100 apiece. 49 base cards and 46 autograph cards. Buy on eBay. Final Print Run = 1,435 sets. Each sealed pack has 49 base cards, 1 parallel, 2 chase inserts and 1 autograph. PARALLEL CARDS: Blue, Red #/25, Black #/10, Gold 1/1. 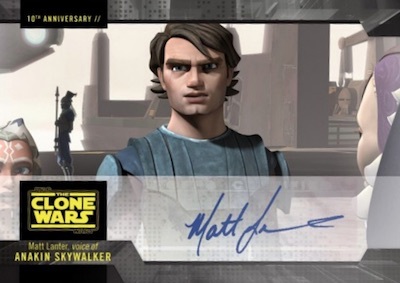 2018 Topps on Demand Star Wars Clone Wars PADME AMIDALA Autograph VERY RARE! 2018 Topps On Demand 3d Sealed Pack Juan Soto SP RC On Front Very RARE! !